Aside from books and beauty I am obsessed and fascinated by old hollywood- actresses, icons, socialites and so on. I have a huge collection of coffee table books on the subject and love a good non-fiction book about some of these amazing women. I paired up some of my most anticipated 2018 picks with a few, just a few, of my favorite vintage glamour gals 😉 Happy reading! In the new novel from the #1 New York Times bestselling author of First Comes Love and Something Borrowed, a woman is forced to choose between her family and her most deeply held values. Then one devastating photo changes everything. Finch snaps a picture of Lyla passed out at a party, adds a provocative caption, and sends it to a few friends. The photo spreads like wildfire, and before long an already divided community is buzzing with scandal and assigning blame. In the middle of it all, Nina finds herself relating more to Tom’s reaction than to her own husband’s—and facing an impossible choice. Jackie and Lee- as classic and chic as an Emily Giffin novel. Angelica Huston- strong, stunning and mysterious-. Bohjalian’s novels through and through. Natalie Wood- charming and bright- all things encompassing Weisberger’s books. Marilyn Monroe- smart, game changing and naturally perfect- Cristina Alger’s collection of books. Katharine Hepburn- spirited and unique, the excitement I have for The Intermission! When the women go out for drinks at the hip neighborhood bar, they want a fun break from their daily routine. But on this hot Fourth of July night, something goes terrifyingly wrong: one of the babies is taken from his crib. Winnie, a single mom, was reluctant to leave six-week-old Midas with a babysitter, but her fellow moms insisted everything would be fine. Now he is missing. What follows is a heart-pounding race to find Midas, during which secrets are exposed, marriages are tested, and friendships are destroyed. Babe Paley- classic and rich- the highest praise for Molloy’s debut novel! Twiggy- Iconic. The name Jess Knoll is building for herself with her writing. Mother’s Day is almost here and I found the perfect book for new mom’s, old mom’s and any mom alike! The absolutely beautiful and touching You Made Me a Mother by Laurenne Sala. This book was first a poem written by Sala and then made into a video for Boba, the baby carrier company, which went viral and touched so many women’s hearts. Sala went with the popularity of the video and teamed up with the whimsical and charming illustrator Robin Preiss Glasser– the master artist of the Fancy Nancy series. The two created a book that is so warm and magical you can’t finish without misty eyes, in the best way. Growing up what was the relationship like with you and your mom? My mom was a single mom, so we were besties— two girls having fun in the Chicago suburbs. I really looked up to her when I was younger and thought she knew everything. She taught me how to work a toolbox and get things done without having to call on a man. We had fun, sang at the tops of our lungs in the car, and danced on Sundays to clean house. Then I became a teenager and hated her, but before that, everything was great! Moms are such inspiring figures in our lives.Who are some inspiring women in your life aside from your mom? 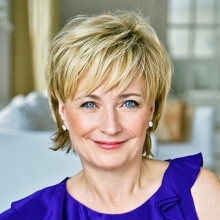 I learned to write within the ad industry, and there aren’t too many women in it! I haven’t had many female professional mentors until very recently when Robin Preiss Glasser, the illustrator of my book and the Fancy Nancy series, took me under her wing. Then, Lissa Price and Michelle Markel, two brilliant authors, came in to help me with this new career, and it has been a delight to be able to call on someone who knows the game and knows what I am going through right now. I also look up to people who aren’t afraid to talk about their truths, like Brené Brown and Jill Soloway. Mainly, I am inspired by each one of my friends for their different lovely attributes. It’s either their generous hearts or their zen attitudes or their assertiveness. My friends are all so great, and I am lucky to know them. 3.I know this was originally a poem, a beautiful one at that. Moms were so in love with this message. When you saw the responses to the video from social media how did that make you feel? I was so absolutely shocked! I wrote the poem, and I didn’t even know the video had been finished. Suddenly, I get a Huffington Post article in my inbox, and I got the chills. I felt validated because I had been writing another book with the goal to “make people feel,” and it had just been rejected by a few agents. So, to know that I could make people feel made ME feel (happy tears and relief). And to know that I had really achieved the goal of capturing motherhood felt wonderful because I’ve felt for a while now that I’m ready to be a mom. Phew! It also meant I could hear the insights from other wonderful people (like my mom and cousins and friends) and turn them into something else, so that also felt great— like maybe I can be a ghostwriter or write historical fiction. Ideas just opened up to me, and my mindset changed from being so hard on myself. I stopped telling myself I should probably quit writing and go wait tables. 4.I know you are a speaker as well. What type of talks do you give and what is your favorite part about speaking on such a great platform? I talk about vulnerability and about how admitting who you really are can help open you up to things in life! I am so passionate about this topic that I started a storytelling show, Taboo Tales. I help people write out their stories and get them to release them on stage in front of a live audience. After seeing how being vulnerable has helped countless people, I started speaking about it at colleges. So far it’s been great, and I’ve learned that most everyone is holding something in no matter how old they are and how taboo it is. This is a piece that explains how I got to that point. It’s deep, so be warned. I like to write in coffee shops with lots of plugs and nobody to kick me out if I stay too long. cuddling. real talk. reading books in the sun on the beach (with a friend and mimosas). When I complete reading a book, I love to look up reviews and see if others agree with me or not. When I complete writing a book, I either want to share it with someone or I don’t. If I don’t, it’s a bad sign. I read Laurie Halse Anderson’s ‘Chains’ and then ‘Forge’ immediately after. I didn’t realize it was a series, and I ran out to get the next one the very day I finished the first. While on tour what is a must-have beauty product in your make-up bag? I’m looking for suggestions on how to be more of a make-up kind of girl. I bring some eye cream. Some Make Up Forever foundation. Some other creams… ? Help! YES! Remember that trilogy I mentioned in #8? The third book has been promised for months, and it’s been stalled. I CANNOT WAIT! It must come out in October, or I will be forever lost. Happy 4th! I am starting my July reviews with a fabulous thriller. I am a huge fan of Kate White’s and count the Bailey Weggin’s series in my top favorite books! 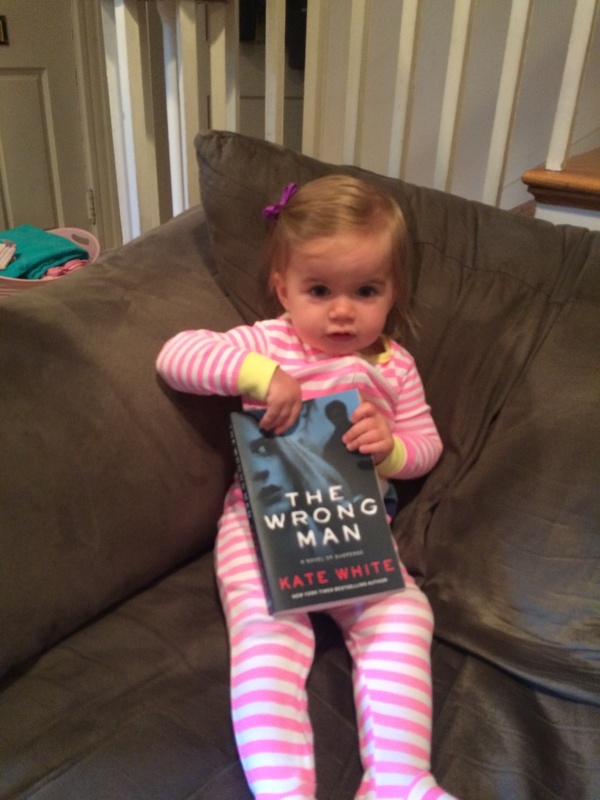 I knew that her newest book, The Wrong Man was going to be just as amazing plus there was something special about this book as there was going to be a character named after my daughter in it. Yes, there was going to be a Chloe in the book! Rewind. 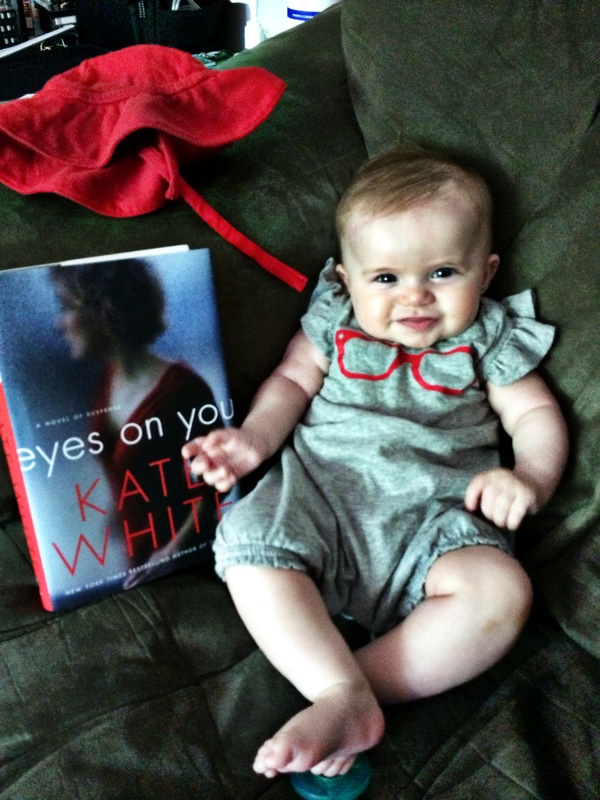 We entered a contest last summer where Kate had requested readers to pose with her then novel, Eyes on You. I sent a picture of Chloe with her detective hat and spectacles and we WON! I was thrilled. So reading throughout the book I was awaiting seeing her name pop up and it did, in a clever little way 🙂 Thanks Kate. Like all of White’s books she leaves the most addictive cliff hangers at the conclusion of each chapter thus making the reader fly through this book. I was so happy to read and review a mystery again. It’s been awhile but they are oh so good. 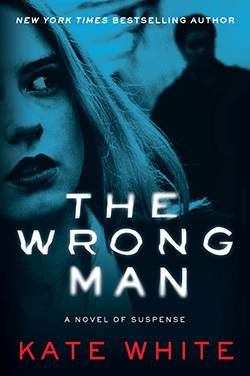 The Wrong Man starts off with its main character Kit traveling for business in Florida. Wanting a change of pace in this moment of life she decides she is going to do something spontaneous and fun. She meets Matt Healy, also on business, who is mysterious, charming, the full package. After a romantic dinner they both go back to the hotel and things develop from there. They both have the mindset “no strings attached” and decide the next morning it was a great night and let’s leave it at that. Kit is ok with this although there is a part of her that is drawn to Matt and wishes she could see him again. She leaves Florida and heads back to New York but not before she gets call from Matt wanting to meet-up in NYC. They decide the meet for dinner and Matt gives her all the details including where he lives. Kit heads over there to meet him only to find out the man who lives there is not the man she had a fling with but yet his name is Matt Healy. Let the mystery begin. The Wrong Man is a thriller of deceit and murder. From sunny Florida to gritty NYC, White takes you on ride filled with hairpin twists and turns questioning who can you really trust? The spiderweb of characters and lies will have you hooked from the first page as in typical White fashion. Whether this is your first or fifth novel of White’s she does not disappoint! Without a question this is my fourth “Blissful Beach Bag” pick! Let’s keep our fingers crossed she is working on a Weggin’s mystery, I need a little Bailey in my life. Miss Chloe in her winning picture as well as the new book. *The Wrong Man was sent to Bliss Beauty and Books for review purposes.